You’ve topped your pie, or lined your tart tin, or even baked a towering puff pastry creation, but now what should you do with the odds and ends of leftover pastry? Both puff and shortcrust pastry will keep happily covered in the fridge for 1–2 days, but if you don’t intend to use it within that time, the best bet is to freeze it for a later date. Ball together any leftover pastry and tightly wrap in cling film before freezing – use a double layer to make it extra secure from frost bite. Roll together leftover pastry and cut into strips. Sprinkle with grated cheese and a little salt – Parmesan and Gruyère are absolutely delicious, although cheddar would work just as well. These can be made from both puff and shortcrust leftovers, the first giving a flakier texture, while the latter will be crumblier. 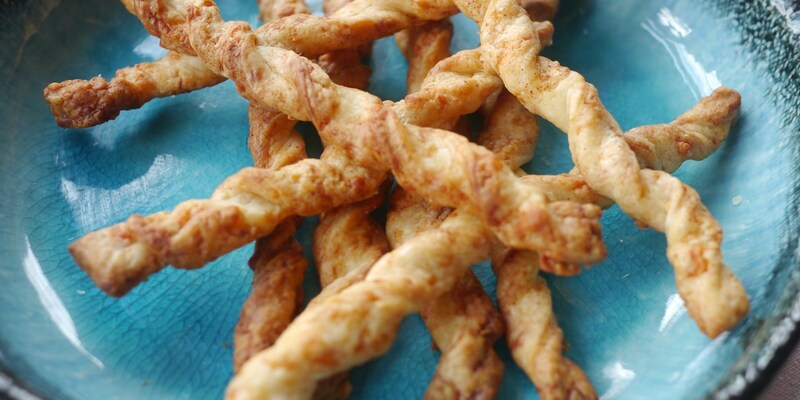 Try Nathan Outlaw’s Cheese straws with poppy seeds. James MacKenzie takes this idea one step further and uses puff pastry to make tempting Crab sticks seasoned with fennel and lemon. To make palmiers, roll together leftover puff or shortcrust pastry into a sheet and sprinkle all over with cinnamon and sugar. Roll up the sheet from both of the longest sides in towards the middle to create a double scroll. Place on a flat tray, and chill in the freezer until almost frozen, then cut into 1cm slices and bake in the oven until golden brown. Graham Hornigold’s Roasted rhubarb dessert uses crystallised puff pastry as a garnish, similar to an arlette, which could easily be achieved with any puff pastry scraps. Try Adam Byatt’s Mini mincemeat puffs for a festive treat – a twist on the traditional palmier with a fruity mincemeat filling. Puff pastry is great with all types of toppings and mini tarts are really quick and easy to make. As a simple lunch, or even a quick canapé, stamp out rounds from the leftover pastry and top with tomatoes, cheese, herbs, cured meats or roasted vegetables. Bake until golden to serve. For a simple canapé, vol-au-vents are a good choice as leftover puff pastry can be cut out to small rounds, scored with a thin border, then baked until risen and flaky. Cut out the scored lid and fill with anything you like. Colin McGurran opts for sticky a sausage and marmalade filling, while cream cheese and smoked salmon would be another classic combination. Shortcrust pastry can be rolled out and pressed into small tart cases, then filled to make quiches or mini jam tarts. Perfect for a quick, yet indulgent start to the day, leftover puff pastry can be rolled into any number of traditional pastries. For mini croissants, roll out the pastry and cut into long, thin triangles, then roll up from the base to point. These could be filled with a little chocolate for a pain au chocolat – just bake until golden brown. For something a bit more savoury, make bacon and cheese turnovers by cutting out squares of pastry, laying your fillings in the middle, then folding two opposite corners into the middle. Bake until golden and the fillings are cooked. For a veggie option, simply swap the bacon for button mushrooms or tomatoes. Leftover shortcrust pastry could be used to make delicious egg cups, as Sally Abé does with her simple brunch recipe. Roll together leftover shortcrust pastry, roll out and sprinkle with sugar, cut with a shaped cutter of your choice, and bake to make tasty teatime treats. You could also fold in dried fruit such as raisins or apricots, chopped nuts or chunks of chocolate for something a little more interesting to serve with afternoon tea.